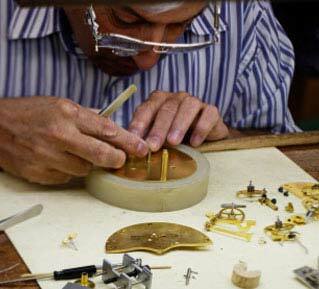 Chelsea Clock master clockmakers use specialized clock repair tools to repair clocks of all ages – and of many makes and models – right here at our factory in Chelsea, Massachusetts. Specializing in fine mechanical, quartz and striking clock repairs, our certified experts bring a combination of old-world craftsmanship and state-of-the-art technology to the repair of every timepiece. Oiling, regulating and accuracy-testing movement and strike functions for a full two weeks. Our master clockmakers have over 80 years of collective experience repairing antique timepieces, aged and damaged clocks, and newer timepieces.